It was a job to get that stuff cleared out of the camper, but it was fun to see what treasures there were that we'd stowed in there the last time we used it. Some of the items I'd forgotten about, but I did remember that this quilt was in there. Back in the 70s I started making "crazy" patchwork quilts. We lived in Tucson, AZ at the time and I sold them at craft fairs . . they were very popular! I also made clothing items, including kids clothing from patchwork blocks. I made this king-sized quilt for us. Some of the fabric blocks are quite worn but most are still in good shape. It's a pretty sturdy and cozy quilt. In looking at the fabric patches I was reminded of the things I made from that fabric . . 30+ years ago!!! A lot of it was clothing for my kiddos! Another trip down memory lane! I washed it, let it dry on the line and it smells like fresh, Colorado sunshine and air! I got a nice skirt and sweater at a thrift store on a weekend trip before that. I love thrifting out of town! That's an awesome find, Sandra! 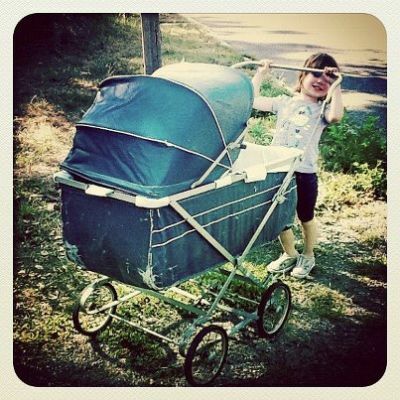 Our most recent find was the pram we took from someone's discard pile and will fix up to hold our little one's dollies and stuffed animals in her "big girl room" coming this October. Sandra, I think we were near where you're from during our visit to Michigan, recently--we really loved the area surrounding Ypsilanti, especially some of the more rural areas (and it didn't take long to get out to those). Any ideas about moving up that way? I went to school way up north, near Traverse City, at Interlochen Arts Academy, but it's a whole different ball game. Melmac plates with blue roses, and a green bowl...all the plates were $.75 total, and the bowl $.25. I also found this vintage, round butter dish for $2.00 (marked down from $9.00), that one couple was selling, along with other antiques in their garage. I also bought 6 vintage green glass wine glasses for $2.00 total. After we got home and googled the stamp on the glass, we are 99% sure they are vintage glasses from a glass factory that was in the same town we do our Farmer's Market. They have tours with glassware on display, so we have plans to take one over to have someone to verify that it is indeed their glassware. They sell for about $12.00/each or so. I also bought one of those wooden, accordian style, expandable towel racks. I paid a whopping $.25 for it. Check over on "Make it Easy" to see what I used it for. Kristina, you found some real deals. Isn't it fun to go to these sales? Hard to get my hubby to go to them. I found the most interesting scarf at an antique mall in Las Vegas, NV near my home. It is a membership scarf of the Nevada Cowbelles. Curious at how old scarf may be, I began looking up on the internet names of members or their ranch. What makes it really great is they have their Cattle Brand symbols on it too. What a grand group of people represented on this scarf. Many have relatives still living on the land, so I won't go into detail and will keep it as privatized as possible. But sad stories on how some of these grand women died, had to sell their ranches, and other losses due to difficulties in raising and selling cattle were found in newspaper articles and obituaries. Most of these women were cut from the "same cloth" as many of our own Mary Jane Farmgirls. They contributed in larger than life ways to their communities. The scarf now reads like a book with individual diaries on their lives. I have copied the information and have it tucked away with the scarf. One member, Anna, from this scarf, was born in 1898 and passed away in 1987. She was the first president. Later the name Cowbelles was changed to Cattlewomen. Really cool. I am glad I am now the "keeper" of this scarf, which is silk! I found a vintage "diner" style coffee cup today in the free box! And, 3 pieces of fabric perfect for my apron business: total of 7 yards of fabric for a total of $3.00! A medium sized, blue Samsonite "Medalist" retro suitcase for TWENTY-FIVE CENTS!!! Yup, yessiree . . a quarter! Of all the suitcases in the thrift store it was the one without a price tag and the only one I really wanted, and it really good condition. I told the guy at the counter there was no price on it, he looked it over and said, "well then, it's a quarter"! Going to give it to my glamping partner, my daughter as she was wanted one for her own things when we go glamping. I have a 15 year old one that I bought when my first baby was born. It is a silver cross coach built that I had imported from England. I almost have thought about selling it but dream about pushing my Grandkids in it one day. When I have room, I am thinking of leaving it out and just putting in some dolls. BTW I have two childrens prams that match mine too! My Nan bought them for my older girls when they were little. I can't find the heart to sell those either. They are stored at my ex father In laws house and I will have to get them sometime soon before he gets fed up and gets rid of them. I just loved walking my babies in mine and had a little seat on top when my second baby came along to ride the toddler on top. Origionally I had a pretty white eyelet sun canopy too, but that got misplaced in one of my many moves.. I also made eyelet bedding for it too. Busy Making Lemonade with all the Lemons that life gives me... Finally tasting sweet!!! I needed some small "gratin dishes" for baked eggs. I finally found some really nice (new) ones at Cost Plus for %3.99 each! What a deal!!! Beautiful dishes. Your herbed baked eggs and sides look delicious. Nancy, That does make a lovely setting. Woo Hoo Scored an awesome find on some embrodery thread. someone took a lot of time to set up a really nifty filing system for the yarn: snack size ziplock bags and 2 split ring keyrings, nicely numbered in order. there are about 50 bags o each set of rings. Unused for the most part. as i started looked, each bag had at least 3 skeins in it. so about 150 skeins for $15, pretty much one of every color for 10 cents a color. now to decide what to do with it first. A lovely oval tablecloth with pansy print, a full-sized flat sheet, 2 beautiful doilies, 2 yards of wonderful fabric (for my apron making), beautiful handmade quilted table topper, 3 pair of jeans (Eddie Bauer, Cabelas and Calvin Klein) . . . TOTAL? $10.00 That's it . . 10 bucks! Wow. Some beautiful finds here. My latest is a "retro" suitcase for $6. It has a peculiar looking key that actually works to lock the suitcase. I found the key in a pocket inside the suitcase. I found a nice 12 cup coffee maker for the holidays, $4.00 a Goodwill, and a 10' garland (all wood pieces) at a rummage sale for $2.00, fun! I found a like-new Coldwater Creek wool and cashmere blazer at Goodwill for $5. It's so soft and warm! Oooo, I LOVE their stuff!